So that's it, all the wood is now stripped from the deck. All things considered, this part of the project went surprisingly well. There is no doubt in my mind that the chainsaw route was the way to go, and along the way I learnt a fair amount as well. Most notably how to sharpen a chainsaw chain effectively - get those angles on the file just right! The big four foot crowbar I bought also helped make light of what I thought was going to be a mare of a job with those last, difficult, sections of wood that needed prising from around their studs. Now I've got to get rid of that wood. Just to make life that much more interesting for me, the folks at the marina I use have refused to allow me to keep a skip there for the few days it would take to ship the wood ashore. Knee deep in dirt and completely exhausted in the evening, it's easy to loose sight of the bigger picture. 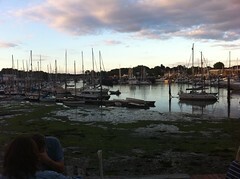 Here Patch and I relax with an evening meal at the Jolly Sailor in Bursledon, after skimming round from the River Itchen in the rib (hbi for you guys in the US). You can see the rib floating in the river there. It's a lovely, tranquil, spot well up the River Hamble, and I can well recommend both the food and service there. Getting to do this kind of thing is what it's really all about. 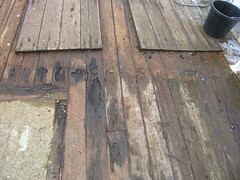 Here you see the state of the deck after most of the wood has been prised off. Now I need a bigger hammer and more powerful jimmy to get the last, tough, pieces of wood up. The crowbar I was using seems to have got itself somewhat bent so, along with an 8lb hammer, I've also got myself a gorilla bar, which sounds apt really. I also bought a bigger bolster, kind of a big chisel, as the other smaller one has been very handy, but was just not quite man enough for the job. Having two now will be the business! It would be laughable if, with all these new toys in the truck, I was done for going equipped while on my way down to Lady Jane. I'm a bit busy at the moment, so no time for a post. Just so as you know, the LED is still on and seems as bright as it ever was. 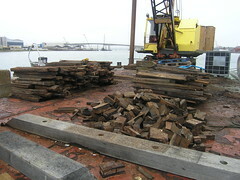 Here you see the wood so far hacked from my deck, all piled up ready to be taken ashore. 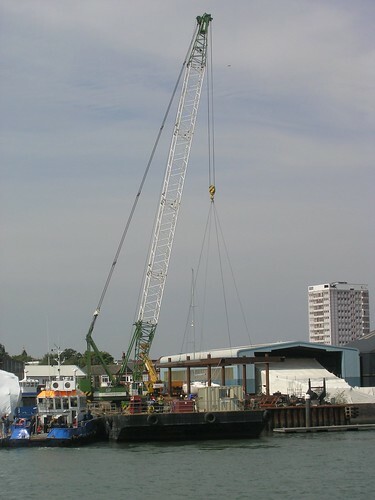 There is also another pile at the back, just visible to the left of the crane there. The small chunks you see in the foreground are the bits prised up from around the studs which did not 'pop' off the deck with the aid of a crowbar. In volume terms there is not that much more to come off, but the last bits are going to be the toughest, as the difficult to remove bits have been left in favour of ripping out the easier stuff. My original idea was to take the wood to the tip in my truck, in several loads, which is why it's all cut to such neat lengths. In reality, seeing the wood stacked like it is, this is probably going to cause issues for me with the tip people when I try to dump such a large quantity of wood. I'm now thinking of hiring a skip, which would cost about one hundred quid. The skip would save me, and the truck, a fair amount of work and hassle. One thing I've found: No matter how much of a state things get for me, there is always someone worse off. This was towed past Lady Jane a few days ago. This is getting a bit repetitive, I know, but the led light is still glowing brightly. It's more than three weeks (500 hours) on the same batteries now, pretty amazing I'd say. This monster big crane showed up on Sunday afternoon. 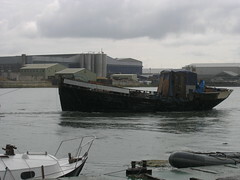 It was shepherded up the river on Willcarry 1500 by two tugs, making an appropriate amount of noise for such a big piece of kit. I've no idea what the steelwork they hoisted onto the barge is intended for, but I bet that operation did not come cheap. Interesting to watch though. I found myself thinking 'that must be a fun job'. All those tiny pieces you see had to be smashed and prised out from the surrounding studs, as the wood and studs there were in relatively good condition. My original idea of cutting the studs through the wood with a big angle grinder cutting disk was a non starter. Because of the very real risk of fire from the hot sparks produced. At the moment, it's impossible to avoid tramping mess into the galley, and also the rest of the boat. Especially when it's a bit wet underfoot. I'm sweeping up as best as I can as I go, but the rusty deck needs proper rust busting before the dirt is finally gone. I also notice that the pristine clean, white, bulwarks are now spattered with brown stains from the chainsaw or splashes from the inevitable puddles on deck. The impact of all this mess, everywhere, is hard to describe. Visitors on board would, quite rightly, be wondering about my sanity from the look of the place at the moment. I've also been steadily plodding away on the electronics front. The picture shows a clip from a web page I made, which is available using a wireless connection in and around Lady Jane. With this setup, I can now see the voltage any time I want on my mobile phone. The good bit is I can also start and stop the generator from anywhere on board using my phone - provided I'm within range of the wireless router of course. 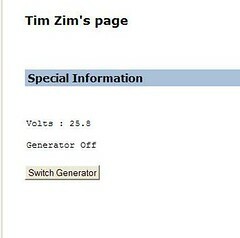 You do need to be logged in to do this, as I don't want people cruising by switching the generator on during the night! Later this will be extended to include other data of interest on board, such as engine temperatures and pressures. This cross sectional picture gives you a good idea of how things were done, and what lies below. The cut piece you can see is from the aft piece of deck, behind the galley door. The wood here was in relatively good condition, as it was always a little sheltered here. You can just see there is a line of studs on the other side of where I'd cut with the chainsaw. All this stuff still has to come out. The routine we fell into was to cut the wood down as close to the steel as possible, in sections, then break and prise the wood away piece by piece. Often, the underlying studs would just pop off at deck level as they were so rusted. Occasionally, like this section, where the studs were in better condition, we just broke the wood away from around the studs with a crowbar and big lump hammer. Needless to say, none of the wood is re-usable. Even if it was not all hacked and broken by us, much of it was rotten through and badly stained by the rusting steel from below. Sadly, it's not even in a fit condition for me to use in our woodburning stove at home. The biggest surprise was the steel beneath, in that there is absolutely no evidence anywhere of any kind of protective treatment for the bare steel. Presumably the people who laid the deck were that confident of the watertight seal they would make, they did not feel it was necessary. The state of the rusty steel you see in the foreground of the picture is representative of most of the rest of the deck. Save for one or two places where there is evidence of much more severe corrosion. 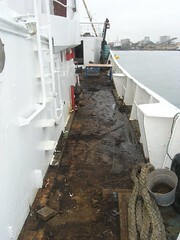 The exception to that is the section of deck which had a gap in the planking open up some years ago. I poured quite a bit of bitumen into the hole, until eventually it made a seal there. 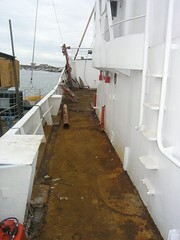 This section of deck seems in better shape than elsewhere, though it is coated with bitumen which is going to be 'interesting' to get rid of now! I'll only know the true state of the steel once it's all been rust busted. 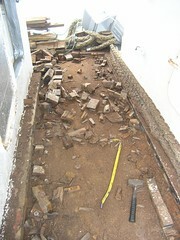 Oh - one last thing - I, as yet, have no idea what to do for the re-laying of the new timber deck. There is plenty else to get done on this project before than, so I have time enough for proper research and a solid plan. The light is still glowing brightly - some 360 hours later. This pictures shows just how much progress Seb and I made on the ripping up the deck project, all the way round from the port side. We got this far ripping up the main boards before blunting the second chainsaw chain. It refused to cut any more, only producing a plume of smoke from where we were trying to cut - not good. 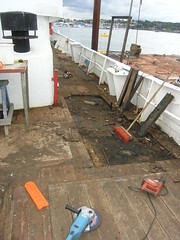 You will also note that the sacrificial decking, the planks laid on top of the main deck, has also been removed. By three o'clock on the second day of this, neither Seb nor I could stand anymore as we were that tired. Time to stop before one of us got hurt. Now it's just the wood on the main part of the deck that needs lifting, and some tricky bits we left at the edges to lift. I know it does not look much in the picture, but we have achieved a fantastic amount. The chainsaw made it all possible, but the crowbar, now a bit bent, was the real star of the show. The great 'replace the deck' project is now finally underway. Seb, from Wendy Ann, dropped by to say hello and got roped into helping. Some six hours later he was still at it. Thanks Seb. The ripped up section you see is the result of our combined efforts after a few hours. I opted to start cutting where I was most concerned about the state of the underlying steel. With the technique a bit better refined, our work rate soon accelerated and we had the wood removed all the way to just the other side of the stern section by the end of a long, and physically hard, day. There is absolutely no doubt in my mind that without the chainsaw, which you can just see in the picture at the back there, we would never have got as far as we did. The underlying steel, so far, looks in better shape than I had dared hope. I'll only really know once all the rust busting and painting has been done. So here's my new toy. 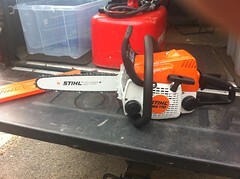 It turns out that it's extremely hard to rent a chainsaw in this country, so I bought one. The guy at the hire shop tells me with a big grin "Probably on account of all the fingers and toes that get chopped off". Oddly enough, the safety gear cost more than the chainsaw. The helmet & stuff I can certainly re-use on other projects, but the hefty leggings - probably not. This puppy is the smallest in the Sthil range, but will apparently be more than man enough for the job. The circular saw used to be my scariest powertool. Not anymore! It's rotten and it's all got to come up - whether I like it or not. Sitting looking at it is not going to get the job done. Talking about it is not going to get the job done. Thinking about it though, now that's a start. After much thought and contemplation, I think the easiest way of getting this deck up is with a chainsaw. 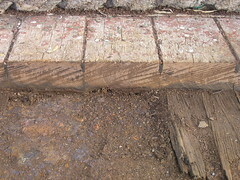 The issue is the deck was bolted down on rows and rows of studs. The studs and nuts that hold the deck down have mostly rusted, such that the nuts are never going to come off without cutting the studs. Some nuts have rusted so much it looks like they have castellated themselves. 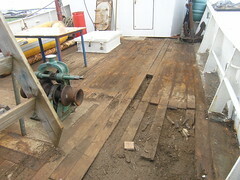 I also suspect the deck is held down with pitch, or maybe glue of some sorts, in places as well. It sounds radical, I know, but with a delicate touch I think the chainsaw is going to be the best tool to use to get the job done. After all, there are people out there who produce beautiful carvings with a chainsaw, so cutting the wood on my deck should not be such a big deal. Oh yes - and plenty of new safety gear of course! Once I've cut through enough wood, but not into the steel, I reckon I can prise the pieces up easily enough. With some wood out, I can then get my big angle grinder in under the wood to cut the studs - and so get the whole lot out. Oops - I forgot my big angle grinder is broken, so that also has to be taken care of. The reason I'm thinking chainsaw rather than circular saw, or a petrol disk cutter with a wood blade, is that the tip of the chainsaw is much smaller so, oddly enough, I should have more control over exactly where I cut - and how deep. A clear mark on the chainsaw blade will, of course, give me a safe depth to cut to. I've plenty to post about, but my proper job is keeping me a bit busy at the moment. I can tell you that my little light is still glowing as brightly as the day it was first turned on. That makes it nearly 200 hours of continual shining, and still going strong.